INFECTIOUS MESSAGING · Part 4: Infection Convey everything in 7 words or less IN 1935 HENRY GUSTAV MOLAISON was a happy 9-year-old boy, playfully riding his bicycle down a familiar street. Suddenly, he crashed, and his life began a course plagued by epileptic seizures. 244 Henry would go on to make great contributions to cognitive psychology and marketing, even influencing the length of your phone number. In an attempt to localize his seizures, neurosurgeons removed part of Henry's medial temporal lobes. The surgery leſt Henry with severe anterograde amnesia. He could remember everything prior to the surgery, but could not encode new long-term memories. Henry's case became even more curious. Although he couldn't remem- ber anything from 5 minutes prior, the last 30 seconds were always crystal clear. He scored perfectly normal on all short-term tests and continued to enjoy playing bingo, solving crossword puzzles, watching television, and socializing with caregivers. Henry's case provided the first pieces of evi- dence that humans have a powerful short-term working memory. The pe- culiarity is that the short-term memory appears to have a finite capacity. 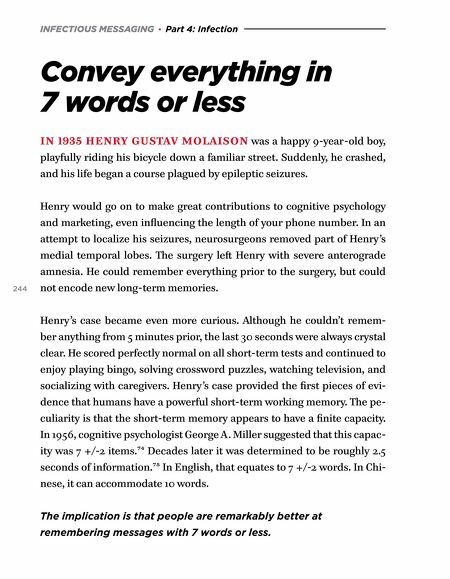 In 1956, cognitive psychologist George A. Miller suggested that this capac- ity was 7 +/-2 items.74 Decades later it was determined to be roughly 2.5 seconds of information.75 In English, that equates to 7 +/-2 words. In Chi- nese, it can accommodate 10 words. 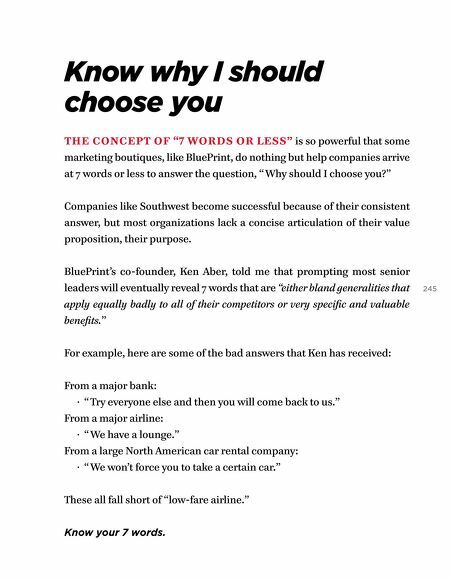 The implication is that people are remarkably better at remembering messages with 7 words or less.